This article is about the Wyoming county. For the Utah county, see Uintah County, Utah. Uinta County comprises the Evanston, WY Micropolitan Statistical Area. 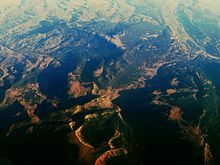 The 161 km wide western North American Fold and thrust belt extends from Alaska to Mexico, forming several northerly trending thrust faults in southwest Wyoming, including the Crawford, Absaroka and Hogsback (Darby), which formed from the Late Jurassic through the early Eocene. The Painter Reservoir Field was discovered in 1977 from the 407 m thick Nuggest Sandstone which forms an anticline structural trap in the hanging wall of the Absaroka thrust plate, at a depth of about 3 km. As of the 2000 United States Census, there were 19,742 people, 6,823 households, and 5,144 families in the county. The population density was 10 people per square mile (4/km²). There were 8,011 housing units at an average density of 4 per square mile (1/km²). The racial makeup of the county was 94.32% White, 0.11% Black or African American, 0.87% Native American, 0.27% Asian, 0.07% Pacific Islander, 2.86% from other races, and 1.50% from two or more races. 5.34% of the population were Hispanic or Latino of any race. 27.7% were of English, 14.8% German, 8.3% American and 6.9% Irish ancestry. There were 6,823 households out of which 44.70% had children under the age of 18 living with them, 61.20% were married couples living together, 9.90% had a female householder with no husband present, and 24.60% were non-families. 20.90% of all households were made up of individuals and 5.60% had someone living alone who was 65 years of age or older. The average household size was 2.84 and the average family size was 3.31. The county population contained 33.50% under the age of 18, 9.00% from 18 to 24, 29.20% from 25 to 44, 21.40% from 45 to 64, and 7.00% who were 65 years of age or older. The median age was 31 years. For every 100 females there were 103.80 males. For every 100 females age 18 and over, there were 100.30 males. The median income for a household in the county was $44,544, and the median income for a family was $49,520. Males had a median income of $37,500 versus $21,450 for females. The per capita income for the county was $16,994. About 7.80% of families and 9.90% of the population were below the poverty line, including 11.90% of those under age 18 and 7.30% of those age 65 or over. As of the 2010 United States Census, there were 21,118 people, 7,668 households, and 5,577 families in the county. The population density was 10.1 inhabitants per square mile (3.9/km2). There were 8,713 housing units at an average density of 4.2 per square mile (1.6/km2). The racial makeup of the county was 92.4% white, 0.8% American Indian, 0.3% black or African American, 0.3% Asian, 0.2% Pacific islander, 4.1% from other races, and 2.0% from two or more races. Those of Hispanic or Latino origin made up 8.8% of the population. In terms of ancestry, 33.4% were English, 23.0% were German, 12.0% were Irish, 6.5% were Scottish, 5.1% were Scotch-Irish, and 3.3% were American. Of the 7,668 households, 39.8% had children under the age of 18 living with them, 58.3% were married couples living together, 9.7% had a female householder with no husband present, 27.3% were non-families, and 22.6% of all households were made up of individuals. The average household size was 2.72 and the average family size was 3.19. The median age was 33.9 years. The median income for a household in the county was $58,346 and the median income for a family was $68,949. Males had a median income of $54,766 versus $30,561 for females. The per capita income for the county was $24,460. About 8.2% of families and 12.1% of the population were below the poverty line, including 14.6% of those under age 18 and 7.7% of those age 65 or over. The Wyoming Department of Health Wyoming State Hospital, a psychiatric facility, is located in Evanston. The facility was operated by the Wyoming Board of Charities and Reform until that agency was dissolved as a result of a state constitutional amendment passed in November 1990. ^ "Uinta County Map". Atlas of the World 1888. Rand McNally & Co. Archived from the original on March 28, 2012. Retrieved August 2, 2011. ^ "Population and Housing Unit Estimates". Census.gov. Retrieved January 13, 2019. ^ "US Decennial Census". United States Census Bureau. Retrieved August 18, 2015. ^ "American FactFinder–US Census Bureau". Factfinder.census.gov. Retrieved January 9, 2018. ^ WDH Who We Are - Wyoming State Hospital Archived July 13, 2007, at the Wayback Machine. Wyoming Department of Health. Retrieved on December 12, 2010. ^ WDH Directory[permanent dead link]. Wyoming Department of Health. Retrieved on December 12, 2010. ^ Evanston city, Wyoming[permanent dead link]. U.S. Census Bureau. Retrieved on December 12, 2010. Wikimedia Commons has media related to Uinta County, Wyoming.